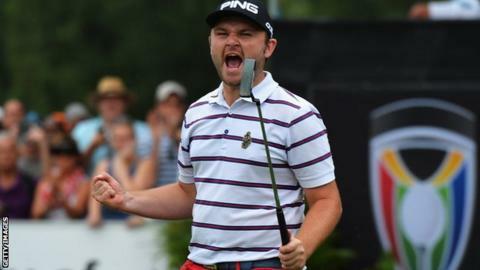 Andy Sullivan will make his Open debut at St Andrews this week, just a month after playing in his first major championship, the US Open at Chambers Bay. But the 27-year-old Englishman from Nuneaton admits that he is now very happy playing in such exalted company. "Whenever I've played with the top guys, generally I play better. "I played with Rory McIlroy and Martin Kaymer in Dubai and ended up coming fourth in the tournament," he said. There is, of course, no chance of Sullivan being paired with the injured Mcllroy at the Old Course this week, but he did once play a round with the man just one place behind him in the world rankings, Jordan Spieth - in the final day singles at the 2011 Walker Cup. Sullivan missed the cut by just a shot at Chambers Bay, where Spieth won his second major of the year, and insists he would have been there for the weekend too, but for a few unforced errors. "I certainly didn't feel overcome by the occasion," he told BBC Sport. "I just dropped a few shots over the last few holes. "I've played well on links courses this year. I've played St Andrews in the Dunhill for the last three years and I know the course pretty well now. Andy Sullivan will make his Open debut at St Andrews on Thursday in the company of another Midlander, Shropshire amateur Ashley Chesters. They will tee off on the famous Old Course at 15:07 BST alonmg with American Harris English. "My game is improving all the time and I've just got to try to enjoy the moment a bit more. In your mind, you think you can compete with these guys, so to go out and then do it has reinforced that belief." Sullivan goes into the 144th Open Championship as England's seventh best golfer, at 54th in the world rankings, having won twice out in South Africa in the first three months of this year. "I've got a lot of results behind me," he added. "I'm going in with a lot of confidence. "The one thing I quickly learnt when I turned pro is that you need to keep improving and I put a good team around me to help with what I needed to do mentally and physically. "In the last two years, I've found my range on tour and started to compete. From when I turned pro, my game has improved tenfold."